As spring blossoms, excitement builds for the year's most anticipated event, the Kentucky Derby. The race always takes place on the first Saturday of May, and each year it gets bigger and bigger, with last year's crowd topping out at almost 165,000. But the Derby is not just a race; it's a full-on sensory experience. An experience that makes the entire state beam with pride, and the rest of the world is just happy to be included in the party. Very few events in our country take place at the same time every year at this scale, and none generate more buzz than the Derby. If one were writing their own "bucket list" (an odious term! 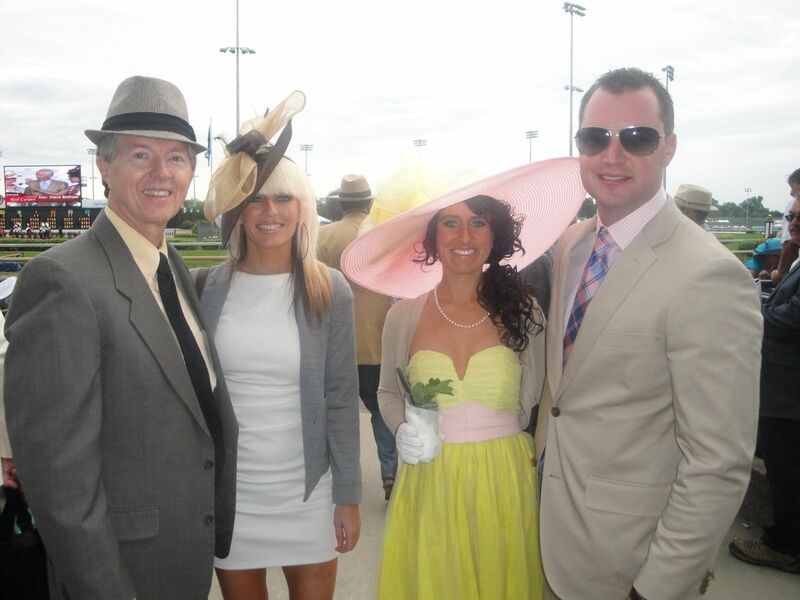 ), it would be necessary to include a visit to the Kentucky Derby. Besides being "the most exciting two minutes in sports" and the most attended horse race in North America, the traditions surrounding the Derby are unparalleled. If and when you plan to attend the Derby, following a few simple suggestions can make your experience unforgettable. Unless you are independently wealthy, are in the Kentucky legislature like our father, own a horse in the Derby, are a D-list celebrity and above or are in the upper echelon of the horse racing industry, chances are you're going to pay out-the-nose for a traditional seat at the Derby. Jill and I have been lucky to use our father's face-value seats, which are on the first floor Clubhouse, directly near the finish line. The average ticket price on the day before Derby ranges somewhere in the ballpark of $670 per person. Ouch. However, there are a few options available to those that may still want to be a part of the event, get dressed up and witness the spectacle that is Derby Day. For a mere $40 in advance ($50 at the gate), there are an unlimited amount of General Admission tickets available to the public. This also includes admittance to the infamous infield, if you so dare to enter there. If getting dressed up is more your thing, I would recommend sticking to the Paddock area. Although you'll never lay eyes on the actual track, you will be amongst fellow fans swarming directly below the iconic twin spires of Churchill Downs. Jumbo-trons and ESPN cameras are perched on the balconies so everyone can feel like they are a part of the festivities. Since it is the Paddock area, you will be able to see the horses and jockeys before they head to the races. Get blissfully lost in a sea of hats as you mingle and meander throughout the grounds. Even before you head to the Derby, it is essential to meticulously select your outfit, of which the most important element is your hat. Jill and I have donned our fair share of hats in the past, some big and some even bigger. The rooms at my parents house where we store them are beginning to resemble a hat shop! You have the option to buy a ready-to-wear hat or try your hand at fashioning a custom design. Jill and I usually choose the latter by purchasing basic hats and embellishing them with various feathers, ribbon and flowers from a local craft store. You're guaranteed to have a one-of-a-kind creation on the day of the races. There are many resources for finding hats; we've had success locating hat bases at Dillard's, Macy's, Steinmart and even Burlington Coat Factory. Online stores are another great resource for hats. Ebay and Etsy offer various options, as well as independent millinery shops across the globe. Ladies, you can either choose to wear an off-the-rack dress, alter an existing one yourself, or find a seamstress to fashion whatever you can dream up in your head. One year, Jill wanted a dress inspired by Scarlett O'Hara's Twelve Oaks Barbecue dress, so she had our family friend Robin make one for her. And our cousin, Amber, bought a dress from a discount store and totally altered it to suit her body type. In fact, she was featured on New Dress a Day a few years back. Men, we haven't forgotten about you. Quite frankly, the men nearly upstage the women when it comes to fashion prowess. Seersucker is certainly the fabric of choice, but you will see many varieties of gingham, linen, and pastels, as well as Madras coats. We suggest at least one signature item to break away from the everyday, whether it's a bow tie, newsboy cap, a Fedora or vest. You could even combine every one of these options and still be welcomed with open arms. 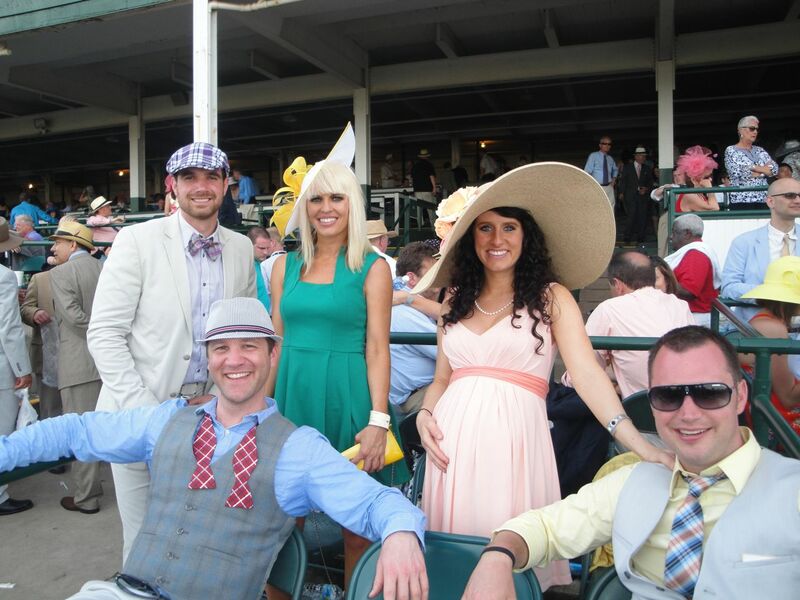 Just remember, the Derby is one big photo-op, so if you dress the part, you're likely to be asked to have your picture taken. On Derby Day, the early bird gets the worm, or more specifically, the better parking spot. The people of Louisville see this day as a time to become entrepreneurs and many people living within miles of Churchill Downs rent out their yards to offer parking to the sea of people descending on the town. This is perfectly normal. We usually pay about $20 in cash to park for the day. Your vehicle should be safe -- just don't leave any valuables there while at the races. Parking is not close, so be prepared to walk. Alternatively, you can seek out a random person who is offering "valet" service in their personal cars. They will try to get you as close to the gate as possible. Some girls bring a pair of thin flip flops to wear as they walk, but I try my hardest to wear high heels the entire time. More remote parking lots are available at Papa John's stadium for $15 and the Kentucky Fair and Exposition Center for $8. Shuttle services are also available -- just check the Kentucky Derby website for more details. Be sure to draw out some cash for parking and betting before you head inside Churchill Downs. Although there are plenty of ATMs, sometimes the lines can be quite long. No umbrellas are permitted in Churchill Downs. One year when it was raining particularly hard, we walked from our parking spot with an old umbrella that we didn't mind losing. Unless you're the last person leaving Churchill at the end of the day, chances are you may find your same umbrella still sitting where you left it or you may just find one similar to your old one. Many people bring clear ponchos to protect their attire from the rain, but not lose visibility of their special Derby outfits. If you plan to bet on some horses, buy the official program. Throughout the day, around a dozen horse races take place before the Run for the Roses, so there is plenty of opportunity for you to hone your betting skills. Take a few minutes to study the program and understand the many facets of horse racing: track conditions, previous races and placing, post position, track/turf length, jockeys, owners and winnings, just to name a few. Of course, you could just blindly bet on your horse simply by the name. There is always that aspect of luck in horse racing, when educated bets can be thrown out the window in favor of "gut feelings". I think one year I bet on a horse because it had the word 'reggae' in its name. I told myself it was meant to be, and I definitely lost money on that one. I recommend that you bet responsibly and budget ahead-of-time how much you are willing to spend (a.k.a. lose) on all the races, and chalk it up to an entertainment expense. After we get settled in our seats, our first order of business is to order the Mint Julep in a commemorative keepsake glass. What makes the Mint Julep a real icon of the Derby is that it is mixed with bourbon, made right here in the Bluegrass State. Be sure to check your teeth after drinking one of these as you're sure to have some mint leaf particles wedged in an unflattering position. Even if you're not a bourbon fan, this is one of those life experiences you don't want to miss. No one will force you to consume more than one, so if it's not to your taste, you can always rinse out your glass and switch to your drink of choice. A less wasteful approach? Ask a random stranger if he or she would like to finish the rest of your drink. You may be surprised by the number of obliging people. Singing my "Old Kentucky Home"
My favorite highlight of the day is the emotional moment when the entire crowd joins in chorus to sing the state song, "My Old Kentucky Home," written by Americana composer Stephen Foster. The grand stand swells with pride and the world seems to pause as we honor the state of Kentucky in this nostalgic, melancholy tune. I suggest learning the song, or at least the refrain, "Weep no more my lady" beforehand so you can participate fully. Don't be shy... even if you aren't blessed with a good singing voice, belt out the tune anyway -- people will just think you REALLY like Kentucky and will probably give you a hug. 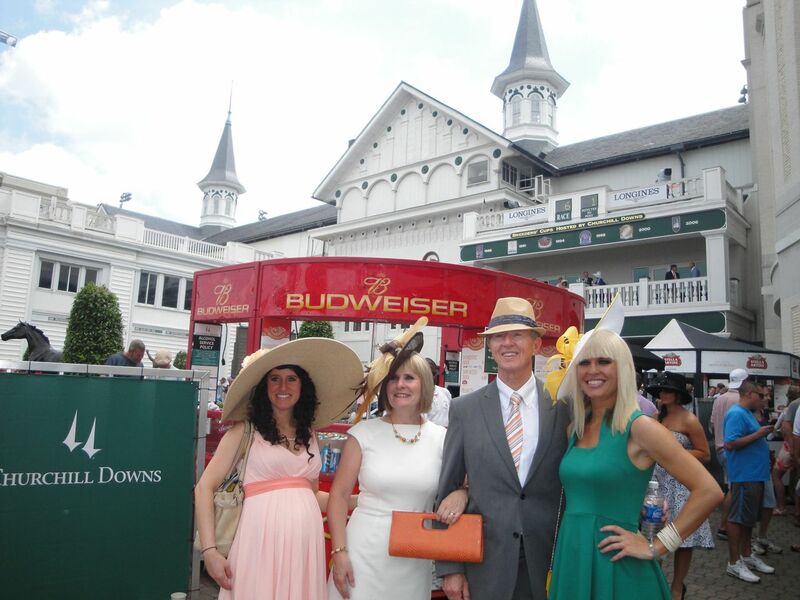 The best spot for a quintessential Derby photo is inside the Paddock with the backdrop of the famous twin spires. Even if your tickets take you all the way up in Millionaire's Row, be sure to stop in the Paddock area in transit and snap that photo. Somewhat elusive, the holy grail of cheesy photo ops is spotting Kentucky Fried Chicken's founder, Colonel Sanders. Although deceased (to quote Family Guy, "He dead, man! "), a jolly lookalike parades the grounds with a bucket of chicken in arms. All too soon, the day will come to a close and a new Kentucky Derby winner will be crowned. Even if you come away empty-handed, you'll have the wonderful memories and photos of your Derby experience and some fashion inspiration for next year's ensemble. Viewed 10994 times so far.